Sold out for now, thank you. "Made of CPM S30V steel just under 1/8" thick, this mini credit card tool features 6 SAE wrench sizes: ¼, 5/16, 3/8, 7/16, ½ and 9/16. Also includes 5 metric wrench sizes: 6, 8, 10, 12 and 14mm. 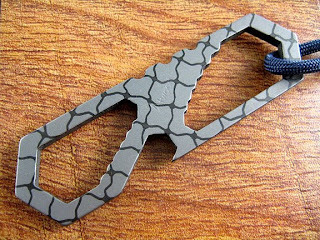 Bottle opener doubles as a 5/16 wrench. 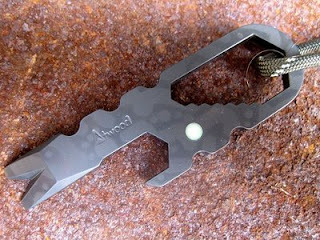 A ¼” hex opening and screwdriver tip is also included as well as a small cutting edge. Be mindful of the cutting edge and use extreme caution when using the tool functions!" These little tools are designed to be carried in a card slot in your wallet. 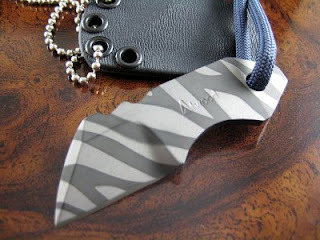 For this reason I will not be making sheaths for them as your wallet acts as the sheath. 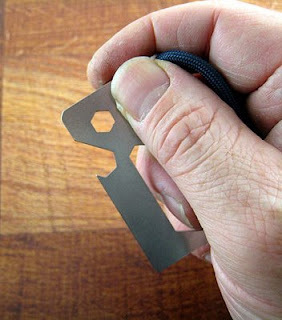 However, I will apply a small piece of extra thick electrical tape over the cutting edge to protect your wallet from incidental slices and to provide a small amount of protection when lightly handling the tool. Electrical tape is a simple solution, leaves minimal residue and is easily replaceable by the user. 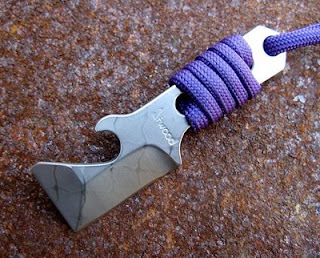 At the same time it gives reasonably quick access to a cutting edge and it is reusable. If it gets worn out just put 3-4 layers of common electrical tape over the edge and trim excess with a blade. Obviously, this is designed to be a last ditch piece and is not supposed to replace a Craftsman tool chest. :) Please be very careful if you go to use the wrench features as the tape will not provide significant protection against cuts if direct pressure is applied to the edge. 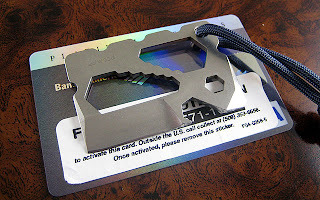 This new design is a nice update to my previous credit card knife designs....before anyone asks, I will NOT be making any more of the little S30v Micro Card knives or the full sized card knives that I produced in years past. Congratulations folks and thanks very much for participating. I will have another go round of DLC Boogers in a few weeks, going to be sending the rest of the small batch out for DLC this coming week. These little gems came out really nice. There are only five and all are different. The Termite one has a tiny Rockwell test dot on the back and the card is labeled Rockwell 58 to reflect this. 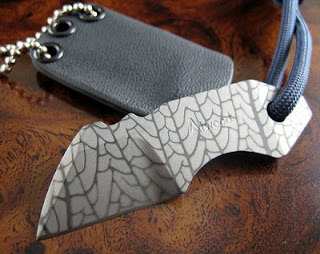 Each will come with a kydex sheath with bead chain. The price on them will be $175 plus $8 shipping for US customers or $26 shipping Express Mail International. Lottery has ended! Thanks to all who entered. After the drawing I'll send emails right away to the winners. First winner to get back to me gets first pick, second gets second choice, etc. I'll post the numbers here as well. If you are one of the winners and you fail to hear from me within a half hour please email me. I have sent emails to all the winners. If you're a winner and you don't get the email for some reason please send me an email. I'm pretty sure I got all the email addresses right but you never know. Thanks folks! I will have more stuff coming up tomorrow or the next day. 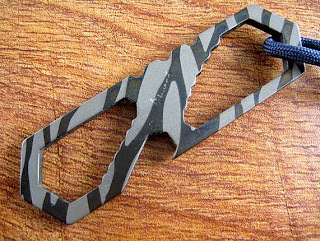 Also, probably end of next week will have the new WildCard credit card knives at the finishing up stage. There are a lot of them currently at heat treat and there will be an open sale once I get them back and do the sharpening. Got a few more goodies done today. These are Titanium FunnyBones that have been DLC coated and patterned for a high contrast effect. I'm really happy with the way these came out and we will be seeing more of this type of thing in the future I'm sure. The Termites were my favorites so I made more of them. Anyway, I have five in the Termite pattern, two in the Jungle pattern and one in the Chainlink pattern, eight pieces total. The way it will work is, after the lottery is over I will send out emails to the winners. The first person to get back to me gets first choice and the second gets second choice, etc. This way we don't have a situation where someone takes hours to get back to me with their pattern choice and holds up the process. 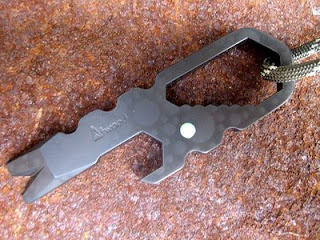 Price on these will be $85 plus $6 shipping for US customers, $12 shipping for international customers. UV Titanium FunnyBones Sold Out! Good morning folks. I have finished a batch of titanium FunnyBones and they have been anodized with the intense and popular ultraviolet color. 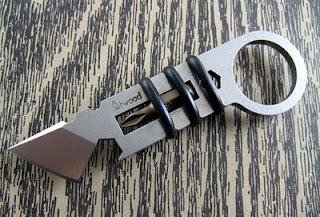 These are the last of them and I probably won't make more of these in titanium or even steel. 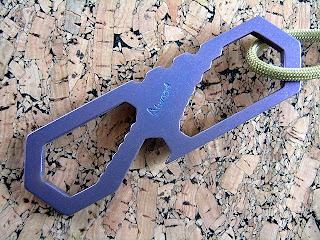 If I do revive the FunnyBone tools it will probably be in a longer version with pry tips as a new Bug Out Bar type of tool. Well that was amazing, 314 people signed up for this one! Thanks everyone for participating, I really appreciate the interest. I'll send emails to the winners in order and the first guy gets first pick, then down the line. Thanks very much folks and I'll have a bunch more of these lotteries for different knives and tools coming up regulary over the next several weeks. The five winners will be drawn at random and first dibs will be given to each winner in the order in which they are drawn. First winner gets first choice, second gets choice of the remaining pieces, etc. Please note the Atwood Lottery Rules, ONE ENTRY PER PERSON and ONE ENTRY PER ADDRESS. If I see duplicate entries they will be discarded. It wasn't exactly clear before so I'm clarifying it now. These will be $80 each plus $6 shipping for US customers, $12 shipping for international. And We Have Four Winners! I have four DLC coated S30v steel Atwrenches with tiki grinds and glow dots. The price on them will be $80 plus $6 shipping in the US or $12 shipping for international customers. I have a couple dozen of G2 Mini Gasbabies available. 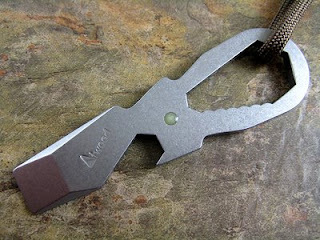 These tools have a nice bright stonewashed finish on them, not the gray bead blast shown in the picture below. This will be the last batch of them for this year. I had a set back last week when the bearings on my grinder finally gave out. I had been meaning to replace them for some time and had replacements on hand. However, when I actually got the thing apart I discovered that the drive shaft was worn out so had to order another one. Got it over nighted and did the rebuild yesterday. 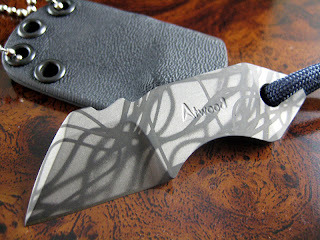 Now I'm working on getting a batch of the new WildCard knives ready to send to heat treat. Should be ready to send off by tomorrow. 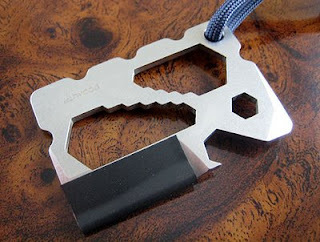 These are the updated credit card knives that I previewed on the Museum blog a few weeks ago. Hi folks! Got two of these done finally. 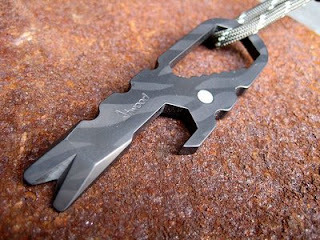 These are matte finished with super hard Diamond Like Carbon coating. One with yellow cord and one with blue cord. 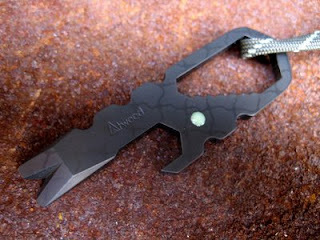 They come with kydex sheath and bead chain. The price will be $180 plus $10 shipping for US customers and $26 shipping for International Express Mail. Lowest number picked will have first choice of color. 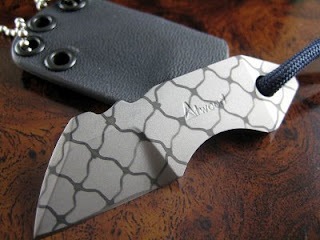 Here's a knife you won't see anywhere else, the prototype for my Sumo design. 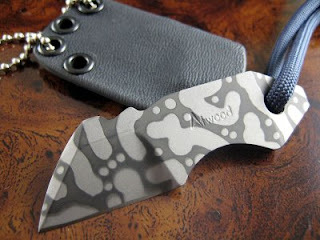 It is made of slightly thinner 1/8" stock and the steel is 420 stainless, OAL is 5.25 inches and blade length is a very fat 2 inches. 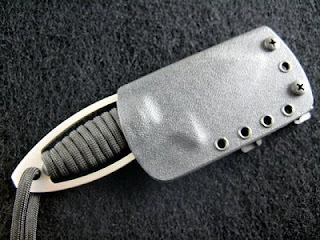 I used a lesser grade of steel to see how the design would feel in the hand and to test the cord wrap channels before going to the more expensive and thicker S30v. The knife is V ground with false edge grinds. 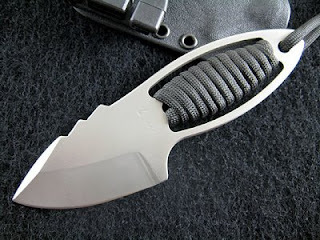 Comes with a kydex sheath and removable mini teklok belt clip. I don't have a metal "PROTO" stamp but the card is written to indicate that it's a prototype. The price will be $175 plus $10 shipping in the US, $26 Express Mail shipping for international. Alright, here's something really nice. A one of a kind talonite Mini Son of PryThing with my Chainlink patterning and royal purple cord wrap. Comes with a sheath and bead chain of course. Talonite is a special cobalt and chromium alloy that is completely rust proof and marine friendly. 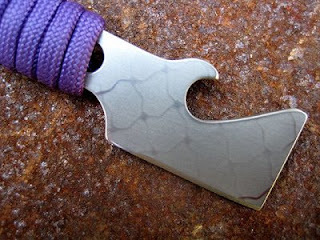 It also has special characteristics that make it able to keep on cutting even when the edge does not feel razor sharp. Neat stuff. The price for this piece will be $225 plus $10 shipping for US customers, $26 shipping via Express Mail for international customers. This lottery will run until 11PM EDT today, Tuesday October 7th. 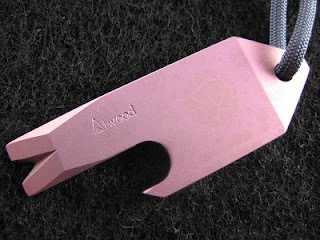 A few weeks ago it became apparent that my traffic was out of control on my site so I decided to announce releases via the blog so people could hammer on blogger instead of atwoodknives.com. Also, that way they could set up the notification methods associated with blogs and stop running robots and quit with the obsessive page refreshing. Now some people are thinking that everything will be released via the lottery system. While that remains to be seen I was envisioning this primarily as a fair method of releasing small batches and one of a kind pieces, not batches of fifty or a hundred. Right now I'm sticking with my previous game plan and I will be releasing larger batches via blogger with a link to a page on my site. Right now I am in between large batches and unless I get to work on the next one this week I expect it's going to be at least two weeks or more before we see the next major release. In the past, there would be no activity whatsoever while I was grinding the next batch. I figure that with the lottery method at least there will be a trickle of stuff coming out on a more or less daily basis. And it will be more of the fun stuff that I have not been able to figure out how to post without getting fifty emails for one object and then having to decide who gets it. This way it is fair rather than subjective. Only those that actually want the item up for consideration will sign up for it so I think it makes a lot of sense. A big Thank You to everyone who signed up. I will be having a bunch more of these offerings in the next few weeks as I finish small batches and one off pieces so please come back and check in again. Hi folks! Got six more RingThings done this morning and I thought I'd put them up for your consideration. 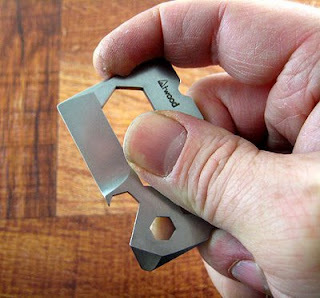 I have already done two or three regular releases of these little tool knives in the past few weeks. I figure this is a good way to let some other folks who did not get a chance to get in on those earlier sales to have a shot at getting one. I'll have another dozen or so RingThings coming up in a few weeks too, once I get more sheaths done. These run $145 each plus $8 shipping via Priority Mail for US customers and $26 shipping via Global Express Mail for international customers. BTW, I reviewed the post and went back to my site to check on the price. I had it wrong, the Atwrenches with the tiki grinds and glow dots with no v notch are listed at $70 plus shipping on my site and that's what we'll go with here. Thanks very much guys! :) I'll send emails out in a little bit. How About an Atwrench Lottery? 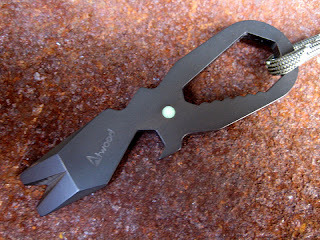 I have six S30v steel Atwrenches with stonewashed finish. These are the ones with the tiki grinds but no V notches. All six have glow dots. Now, two of them have glow dots as shown in the picture and on the other four the glow dots are on the tips and the name stamp is in the middle, in other words, reversed from what is in the picture. I could have posted these separately but I figured they are close enough to the same that I could batch them together and hopefully no one complains. 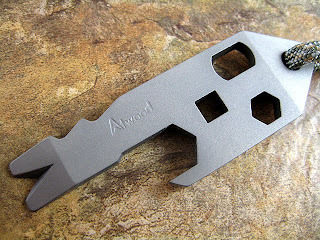 The Atwrenches will be $75 plus $6 shipping in the US or $12 shipping international...also please add 5% sales tax if there any Massachusetts winners. Lottery will run until 9PM EDT tonight, Saturday, October 4th. I think in the future drawings I will email the winner first before posting results. That way if I don't hear back from them within the 24 hours I can pick the next winning number. But in this case since everyone is dying to know I will post it now. This has been a lot of fun. Thank you folks for participating and I will be putting up another round for a different item later today. I got a few emails and comments about the latest releases and as usual I am not able to make everyone happy. Many of you understand that it is impossible to keep everyone happy and I do try hard to get things into as many different people's hands as I can. But there sometimes are lingering questions of fairness and I'm always looking for ways to even the playing field. OK, I had been thinking of this for about a year but wasn't sure how to go about it. Jenny kindly helped me think it through and wrote some software to do it and I am immensely grateful for her help. Folks, we had literally hours of heated arguments over this and how to best do it. I'm not claiming it is perfect but I think it's worth a try for one of a kind or very short run items. I would post an item with description, picture and the price on the blog for your consideration. If you are interested, you can sign up and enter your name into the drawing for the chance to purchase the item. It could be one thing at a time or it could be several of the same items at once. You'd be able to see your number and a screen name displayed publicly but your real name, address and email address would remain invisible and would never be shared. The winner or winners would be picked via an online random number generator service (randomizer.org) and I can post the winners on the blog. Winners would then be sent an email with link to a special purchase page on my site. Winners would have 24 hours to respond to my email and if I don't hear back before then, I would draw a new number. Only one entry per person and duplicates will be discarded. Shipping address on lottery entry MUST match the actual shipping address if a purchase is made. Here's the first time test item. 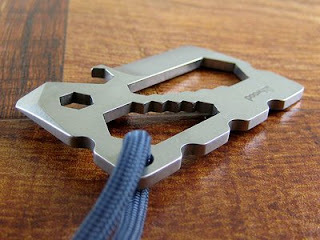 An old school titanium Prybaby. This is a full sized Prybaby that has been cut down to make a shorty out of it. 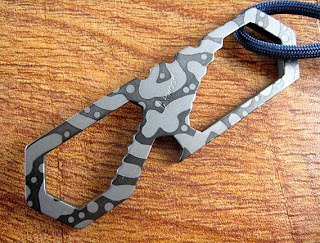 It's bead blasted, has a subtle pattern on it and is anodized in the UV color. Price is $75 plus shipping. Shipping runs $6 for US and $12 worldwide. This will be closed to entries at 9AM EDT Saturday October 4th. Winner will be notified shortly after that. All gone guys, thank you! 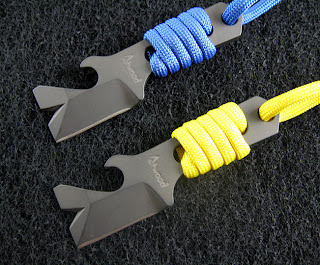 Stonewashed finish, a couple with black cord, rest with steel blue cord. Not enough available to make a sales page. I'm sorry to say that Mini Son of PryThings will not be available next week after all. Upon further inspection in better light this morning I decided to redo them all yet again and add them to the growing batch to be sent for DLC. Pissed me off as I had already cord wrapped some of them but these remaining ones just didn't look good enough to me to release. The problem with the MSOPTHings and the Boogers is that they are so small and light that when they are in the tumblers, they tend to "float" to the top rather than sink lower in the bowl of ceramic media. As a result they may not get the necessary crushing force of tons of stone on top of them which is what gives you the wearing, deburring and "stonewashed" effect. So many of them looked a little underdone compared to pieces with more mass such as a Prybaby. I'm getting a lot of email inquiries and wanted to give an update. I wasn't happy with the finish on a lot of the plain Boogers even after retumbling so they have had additional handwork done to them and rather than retumbling yet again I decided to send them all out for DLC. So, all the plain Boogers that remain have been redone and blasted and are waiting to go to the DLC plater with the next batch. There are only about 20 of them in all guys...I do not know just when I'll send them out as I am still gathering pieces so that I have a reasonable number of parts to make a full load. The first batch of DLC'd parts may be coming back as early as next week. A lot of the batch is knives so they will be released in a trickle rather than a torrent. SOPTHings are very close, probably have them done tomorrow. Plain MSOPTHings will probably be released early next week. There aren't a lot of each. I'm going to be doing a bunch of grinding next week and getting some batches started. I have the new mini CC knives to do, the G3 Prybabies with screwdriver tips in both American and Metric versions and also the new fixed blade knives. Will take several days and I suspect I'll divide them up into 2-3 batches. Once the batches are ground they will be sent out for heat treat and tumbling which takes about 2 weeks to get done. So we are looking at late October for those items.